Car companies already started to figure out that there is something beyond comfort and horsepower that conduces as a source of pleasure and positive experiences inside a car. As shown in other projects, Experience Design – i.e. the fulfillment of basic psychological needs – is such a source for positive experiences. In this project we explored the design possibilities to evoke positive experience by addressing a basic psychological need, namely popularity. Although popularity is also related to negative associations (e.g. power or narcissism) it is also related to being helpful and respectful. Applying this to today’s traffic, you will already find many situations that are related to respect and helpfulness. To voluntary let somebody cross the street, to drive slowly in a reduced-traffic area or to look after bicycles (i.e. inferior traffic participants) is already an act of prosaically behavior. Taking up these practices (based on a short survey, searching for positive practices in traffic) we made them available for everyone by interactive technologies inside the car. This means that the car functions as a tool that enables its driver to behave mindful in traffic. We created several concepts that address this topic. For instance, the “Gentleman” is such a concept. Maybe you are already familiar with this situation. Somebody is going to cross the street and you, as the car driver, start to reduce your speed. Stopping on the open road and performing a hand gesture addresses pedestrians to cross the street. The “Gentleman” rescripts this situation to make is even better for both parties (driver and pedestrian). The car registers your reduced speed and the hand gesture. Headlights are adjusted down on the road. By this the headlights rather illuminate a path for pedestrians than to dazzle them. Moreover a light inside the car illuminates the driver to enable eye contact. Because most pedestrian give thanks to drivers, the Gentleman enhances this dialogue by enabling eye contact through the illuminated interior. Based on our initial survey we know that receiving a “thanks” is important for drivers as a feedback for there thoughtfulness. If the pedestrian crossed the road and the driver presses lightly the accelerator, headlights turn back in their regular position, the interior light is turned off and he could continue its journey. The concept of the “Gentleman” was realized in a functional prototype and participants were confronted with it in a phenomenological study. They were asked to drive a car that was fitted with a functional prototype of the concept. Based on this study we could show that the concept increases security, pleasure and wellbeing in this particular situation of mindfulness in traffic. The “Cyclist aura” is an illuminated area around the bike. 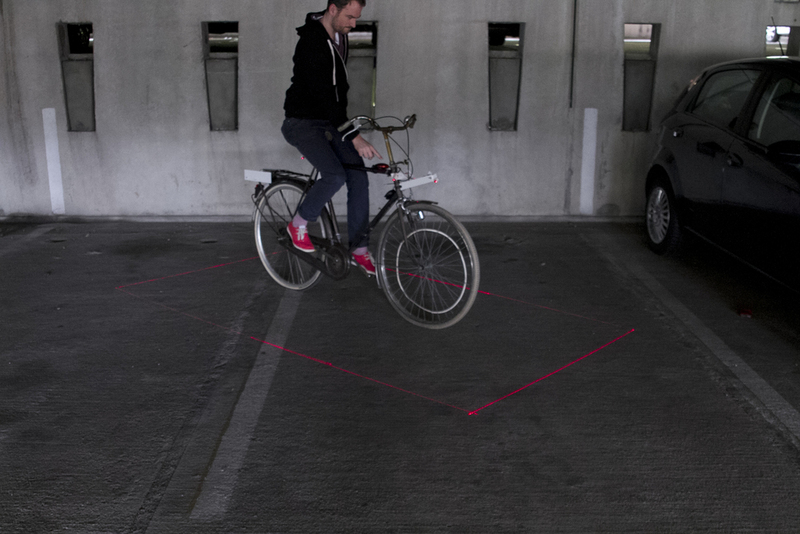 It visualizes the area that a cyclist needs for a safe trip in traffic. Other road users should keep at least this distance to be mindful and respectful. Hence, the cyclist gets an increased feeling of security. The car finds a route through the city. But this route is not the fastest, it is rather the one that do not disturb others. A range of concepts of the project was tested in a phenomenological confrontation with participants. After a short settling-in period participants were asked to describe the concept. Moreover participants were confronted with several situations in traffic that are typical for the concepts.